Despite its reputation as a massive city, living in London is going to give you an opportunity to live in one of the greenest cities in the world. There are dozens of parks and open spaces. Of course you’ll want to visit the grand parks of central London: Hyde Park and Kensington Gardens and Regents Park. There are however a number of smaller parks and gardens that are known only to Londoners. A respite from a weary working day or a great place to spend an afternoon in spring time. Some of the real treasures are not on the tourist maps. Right in the heart of a busy shopping and business area, Culpepper community Garden is a delightful oasis of tranquility and calm amid the bustle of modern London. The garden is located in Islington and is considered a city park as well as an environmental centre. 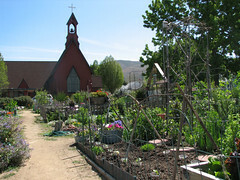 The garden is focused on the community and is entirely organic. There is a large section of vegetable plots that are maintained by community gardeners and volunteers. These small gardens, including two raised gardens for the disabled are for the local community to enjoy the magic of growing and cultivating a garden. Community groups, school children and people who do not have gardens in the neighborhood, all come to lovingly tend the gardens all year round. Different habitats and ecological environments have been cultivated to ensure the diversity of the area, and there is an abundance of birds, butterflies and frogs that make up the wildlife in the garden. Culpepper Community Garden hosts a number of functions throughout the year and annual membership of the garden is a paltry £10. You can be as involved as you want to be. From cultivating your own plot, to using the garden as a welcome sport away from the madding crowds in Hyde Park. This garden is truly for the community. You’ll find that after you’ve been living here for a while, you are struck by the sense of community that Londoners have for their neighborhoods and their city. You’re one of us now, so join in!